Gun Crazy / Deadly is the Female, in the presence of its starring actress, Peggy Cummins. 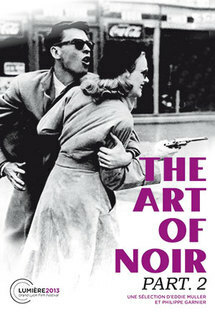 An ace with a revolver (John Dall) and a showwoman shooting champion (Peggy Cummins) combine their skills to rob banks. A mythical and unknown thriller, an ode to crazy love and rebellion, a film that represents marginality in a standardized America. A former soldier who fails to adapt to civilian life is dragged into a bad situation by a friend. A film that reflects the specific social despair of the time. Starring a diabolical Lloyd Bridges, with a desperate and tragic Frank Lovejoy. A woman on parole has sworn vengeance against a policeman, also her former lover, who wrongfully put her in jail. Watch out for Olympic figure skater Belita, «the ice queen» of film noir. Six fugitives get together after their escape from prison in the hope of recovering buried loot. An unparalleled festival of henchmen. Two men trapped in a car after an accident look back on how they got there: a drunk and frustrated femme fatale, a naive inspector, the mixture of social classes, and above all, a fanciful fatalism. An unemployed photographer goes home in the morning after a drinking binge; his wife and daughter leave him. A heartbreaking and thrilling odyssey with Dan Duryea through the streets of downtown LA, as the man tries to save his family.